Dynasties are defined by long-term success and longevity. Programs at Alabama and Ohio State have defined what it’s like to have success, displaying the ability to adapt to new challenges every year. 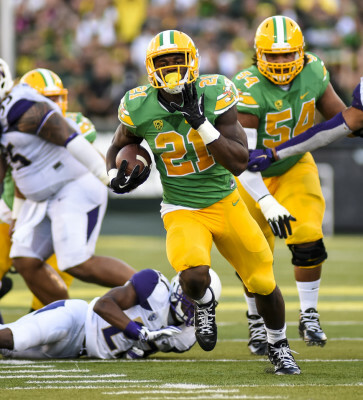 The immediate future lies in the hands of stud running back, Royce Freeman. Right now, whether fans realize it or not, the University of Oregon Ducks’ football team is on the cusp of greatness. Molded by seven 10-win seasons in a row, Pac-12 dominance, and big-game wins; the Ducks are in the position to be placed in the upper echelon of college football. In my hearty opinion, the Oregon Ducks have a chance to solidify itself as the first Pac-12 dynasty since that of the Pete Carroll lead USC Trojans from 2001-2009. I urge you to consider the following when determining whether a team is worthy of being called a dynasty: Success based on precedence, recruiting ability, coaching ability and on-field talent. Read below for a full breakdown of the four points as they pertain to your Oregon Ducks. 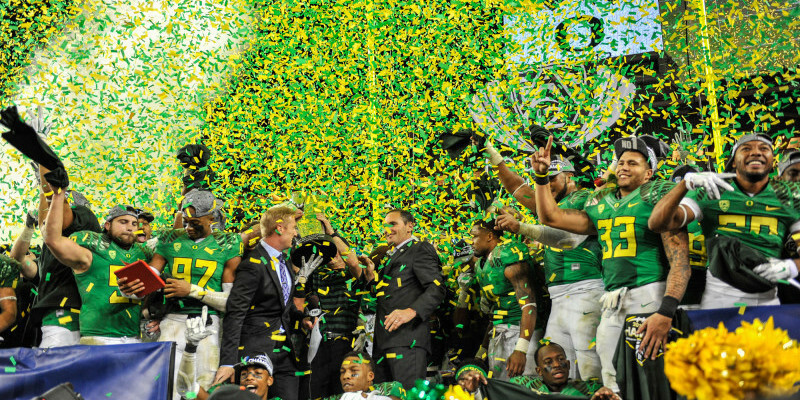 As I outlined in my last article, the Oregon Ducks have seven straight 10-win seasons. Not to harp on the obvious, but these numbers show longevity. A program’s ability to consistently win encourages recruits to give that school priority, fans to commit to attending games and gives the players confidence. The Ducks outdid their opponents last season, so it comes as no surprise that many pundits have them winning the Pac-12 again this season. One thing that could hinder our Ducks from moving into the upper echelon is its lack of national championships — complete lack at that, actually. In the past five seasons, there has been two unsuccessful attempts at gold. Against Auburn, it only seemed impossible in the last few minutes. Everything was going well until an unfortunate play that led to the Ducks’ demise. And we all remember what happened earlier this year against Ohio State. The Ducks have many big wins in its history and a successful season in 2015 will catapult them to stardom. To say that recruiting has been a strong suit for the Oregon Ducks would be a lie. In the past, Oregon had gotten by on its coaching talent and their ability to develop players. The 2015 recruiting class, however, marks the Ducks’ first 5-star commit in a long time — Canton Kaumatule. As a whole, the class ranked 15th-best in the nation — which is six spots higher from that of the 2014 recruiting class. I think that with recruiting, it’s not as important to focus on the current year’s rankings as it is to show a steady rankings increase over the years. The focus of the Ducks’ recruiting emphasis is shifting to the 4-star category. This type of shift can only bode well for a team that has been known to develop talent. It shocks me as to why the Ducks don’t get more elite recruits, but maybe it has something to do with the weather. Whatever it is, the Ducks are starting to figure this thing out. I’d be lying if I said I wasn’t extremely nervous when Chip Kelly made the choice to take his talents to the NFL. Kelly had done so much for the program, combining for an overall record of 46-7, and 2-2 in bowl games. His departure pushed the program against a wall, and to say that new head coach, Mark Helfrich, has done a good job would be an understatement. 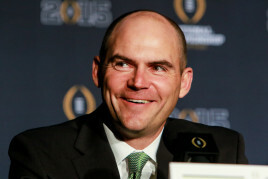 I, too, would be smiling if I was the head coach of the Oregon Ducks. His first season was tough, but Helfrich sought to do wonders in 2014 — and he did just that with a special quarterback in Marcus Mariota. The two created magic together, combining for 12 thrilling wins, only to be defeated in the gold medal game. Helfrich, along with offensive coordinator, Scott Frost, and defensive coordinator, Don Pellum, have a system in place that has proven its effectiveness. Another solid year for the Ducks, and Helfrich and his staff could find themselves responsible for starting a dynasty. Just speaking to the number of household names that the Ducks had on their roster in the last few years will prove this point. With Mariota last year, names such as Kiko Alonso and De’Anthony Thomas, even Royce Freeman and Charles Nelson crop up. 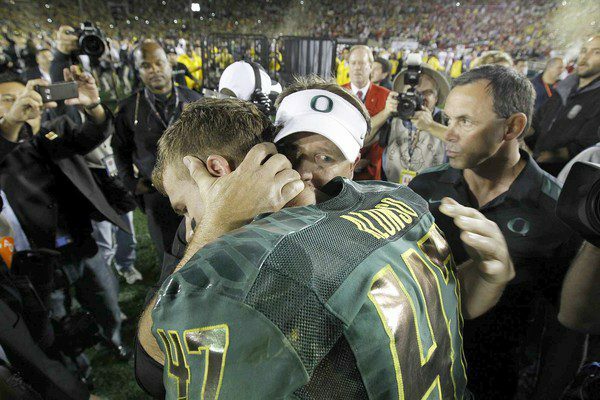 Which current Oregon players will go to the NFL and have the same type of success that Kiko Alonso has had? It’s hard to mention what fans thought of the Ducks’ preseason chances in years past, but this year is much different. Despite losing Mariota and some other key players, Tyler Johnstone is back to anchor the offensive line, Byron Marshall and Bralon Addison are back and ready to play together, linebackers Joe Walker, Anthony Hardrick, Tyson Coleman, and Danny Mattingly are back and ready for more playing time and the backfield looks more stacked than it has ever been. Yes, there is a lot of name throwing going on here, but the amount of preseason talent is enough to speculate about some incredible possibilities. Now, it’s time to put it together and show to every critic that the Ducks belong with the elite.